Another advertising-themed TV series is following Mad Men off the air. Showtime has canceled its comedy Happyish, the network has confirmed. The series, about a disillusioned ad exec (Steve Coogan), finished its first season last month and won't be renewed for Season 2. It's rare for the premium network to cancel a show after just one season, especially given that Showtime Networks president David Nevins was a big supporter of the show. He kept the series going even after its original star, Philip Seymour Hoffman, died in February 2014. "I've stayed with it for a long time because good comedies don't grow on trees, and I loved the first script and then I loved the second script, and then the third one was better, and the fourth one was better than that," Nevins told Adweek earlier this year. "It has relatability, which a lot of premium shows don't have, since we tend to deal more on the margins." But the show didn't make a dent in the ratings. Its June 28 finale was watched by just 163,000 adults ages 18 to 49 in live-plus-three ratings. 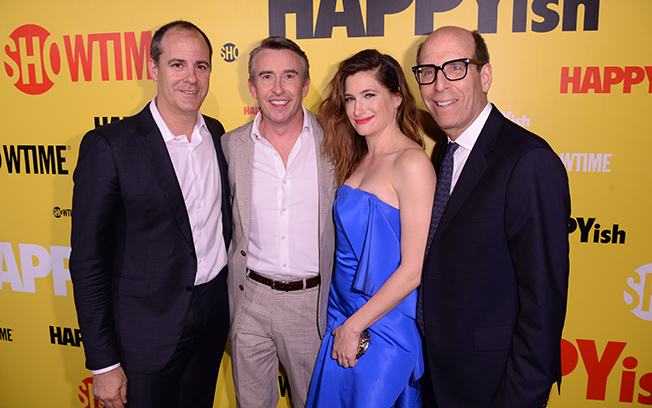 And Happyish also came up empty-handed in last week's Emmy nominations. Given how important Emmy nominations are to the network—Nevins told Adweek that what sets Showtime apart is "breadth and depth of our original series. Last year, eight of our nine shows were Emmy-nominated"—its Emmy shut-out meant the writing was on the wall. The show was created by author Shalom Auslander, who had begrudgingly worked in advertising for more than two decades to supplement his writing career. He started at Mad Dogs & Englishmen shortly after dropping out of college, and later worked for TBWA\Chiat\Day, but also "freelanced just about everywhere," he told Adweek. Though the show often skewered the business that Auslander loves to hate, ultimately "I don't think it's a show about advertising," he said. "I think it's a show about happiness." The show had made some early waves by defiling the Keebler Elves in its debut episode. Nevins had hoped that buzz would continue—he said the show's other parodies of famous ads "will be the things that will generate a lot of conversation"—but that never happened.